I saw this recipe in a food page posted by Meetha and Jayashree and I really got tempted seeing it and thought of preparing it. The original recipe was published in the cook book by Asha S Pillar. Thanks to all for the wonderful recipe and lovely posts. I love salads and I did not wait even a single day to try it. Its very healthy and my son usually doesn’t prefer salads loved it very much. · Soak raisin for 10 min. · Beat curd and keep aside. 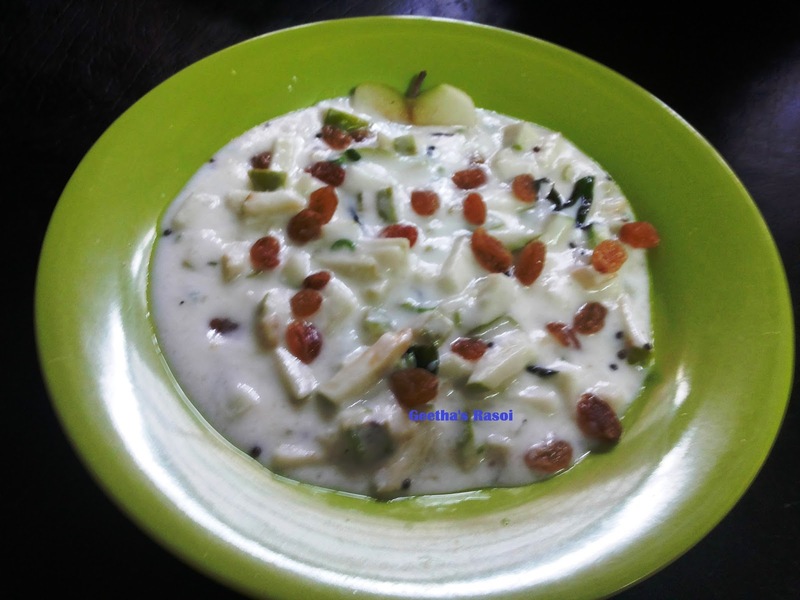 · Chopped green apple, green chilly, mix this with beaten curd mix well. · Add soaked raisin, sugar and salt . · Heat oil in pan add mustard seeds and curry leaves fry for 2 min. · Pour this on curd mix mix it well. · Keep it in fridge for 10 min.